We have a baker! I say this with much pride and joy. I have never been a proper baker and now watching Maggie bake, I can see why. We are the same, but opposite. I cook messy. That is to say, I like to go with the wind. Throw this into it, a bit of that, and hope for the best. One could say it's creative, but one could also say it's impatient and undisciplined. On the flip side, I cannot stand a mess in the kitchen. I clean along the way, wash each item as I use it, wipe the stove constantly, it's a little obsessive compulsive, but it's the way I cook. Maggie baked our desserts for New Years Eve. She is meticulous, precise, and most of all, patient. She is very clean with her baking, but the mess that results in the baking does not bother her. She knows it will get cleaned up eventually, and concentrates on her baking. I admire her discipline. For Maggie's birthday we gave her a baking book, miette, containing recipes from that pastry shop in San Francisco. The recipes are by no means easy and I have to say, the first two cakes she made from the book were spectacular. 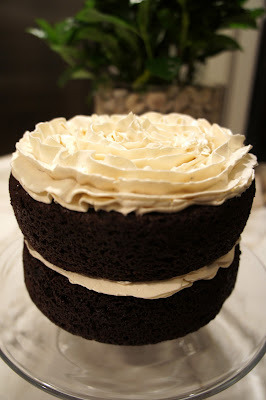 She made a chocolate genache cake and a double chocolate cake with vanilla buttercream frosting. The cakes were wonderfully rich and moist. Over the top good! Admittedly, I got the book largely due to the beautiful photos in it and its cute scallop edged pages. But if the rest of the recipes are as good as the ones for these cakes, I can't wait for Maggie to work her magic on them.